They did call me , I haven't been there yet to look at truck. Still in the negotiation process. So far I have had a positive experience with this dealership. Went last week to trade in a vehicle for a used one and was treated to two of the nicest guys there, Miguel Soto and Carlos. Both very pleasant to work with and NO PUSHY sales tactic. Deal went very smooth, quickly and painless. Even went as far as to get me a new set of wheel locks which were missing from car. Will surly go again when I am ready to deal again. Thanks Guys. i JUST PURCHASE A NEW DODGE JOURNEY FOR MY WIFE AND WANTED TO LET YOU KNOW THAT I HAD A WONDERFUL EXPERIENCE ESPECIALLY FROM MIGUEL SANTOS WHO WAS MY SALESMAN WHEN I MADE THE PURCHASE. HE GUIDE ME TROUGH THE BUYING PROCESS AND MADE IT SIMPLE TO GET EXACTLY WHAT I WAS LOOKING FOR AT THE BEST PRICE. THANK YOU SO MUCH. I received excellent service from Leo. He made my buying experience easy and worked with me through the whole thing. 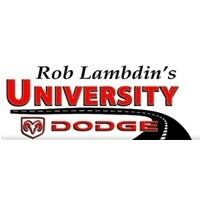 Definitely recommend to buy a car from University Dodge and ask for Leo! I came looking dor a Laramie. But leer in a big horne andas I coudnt hace made a better choise. Because IT has every thing I need in a truck. Thanks to claude McClain. He helped me get the right truck and the payment I wanted. So i would recommend all my friends to go there when they are looking for a ram. Thanks university dodge.